Go on an escape to Kenya and have an adventure with the wilds. 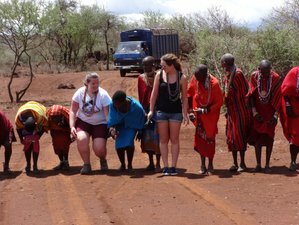 In this tour, you will be able to visit Tsavo East National Park and Amboseli National Park. This safari adventure will be a great opportunity for you to witness the famous Big Five. Do not miss this chance now and be part of this amazing safari adventure! You will have an early morning drive to Tsavo East National Park and then commence the morning game drive through the largest park, with a chance to spot herds of red elephants, lions, giraffes, zebras, gazelles, buffaloes, leopard, waterbucks, impalas, and different bird species. You will check in at either Voi Safari Lodge or Sentrim Tarhi Camp. You will have lunch and after that, you can take your time to relax. On the afternoon, you will hold yet more game drives. Dinner and overnight will be at the accommodation you have chosen. You will depart Tsavo East and drive approximately 250 kilometers to Amboseli National Park. You will have a game drive and check in the lodge for lunch. After lunch, you may relax and make an evening game drive in the magnificent park on the backdrop of Mount Kilimanjaro in search of lions, cheetah, buffalo, and elephant. Plenty of plains game will be seen. Dinner and overnight will be at AA Lodges or Kibo Safari Camp. Lunch, dinner, and breakfast are included. You will have an early breakfast then make the final game drive as you exit the park before midday to have lunch at Lion Hill Camp or Voi Town. After that, you will proceed to Mombasa and arrive on the afternoon at your coastal hotel. Breakfast, lunch, and dinner will be served to you daily.